For most of Roy Eberhard’s young life, there wasn’t time to consider much beyond the farm and schoolhouse. Born March 9, 1894, the second oldest of Llewellyn and Mary Eberhard’s passel of kids, he naturally shouldered responsibility for chores around his father’s dairy farm. There was always milking to be done, not to mention making deliveries, hauling water, chopping wood, and helping with the animals and feed crops. But as Roy passed his 20th birthday, the world started to intrude. More and more news filtered into the local papers, news of hostilities and battles taking place on a distant continent. By the time he turned 23, it became all too clear that even a poor farm boy from central Ohio couldn’t avoid facing the storm in Europe. The U.S. Army called Roy into service four months later, on October 5, 1917. My grandmother—his little sister, Nora—recalled everyone was proud of him, but her mother was worried the whole time he was gone. 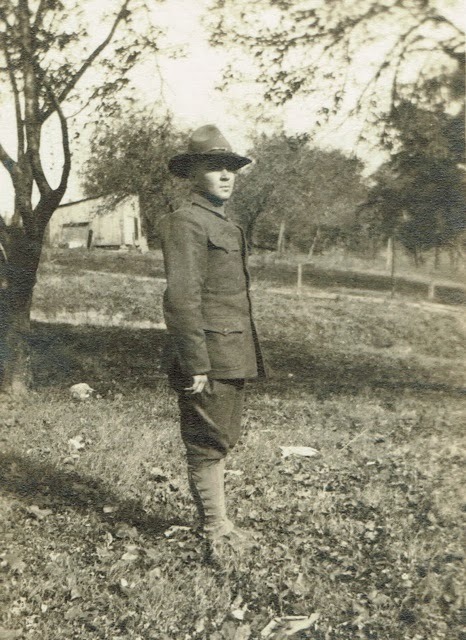 Private First Class Roy Eberhard served in the American Expeditionary Forces in France for nearly a year, from June 1918 to May 1919. He was assigned to the Headquarters Company of the 324th Field Artillery, under the command of Colonel T. Q. Ashburn.2 The 324th was a horse-drawn, heavy artillery regiment. The troops endured difficult marches in which they transported large cannons over frequently muddy roads, without motorized assistance. Once they arrived at a battle site, they moved the cannons into position and awaited orders to fire. The men had to wait for 600 fresh horses before starting the long trek through France and into Germany in December. 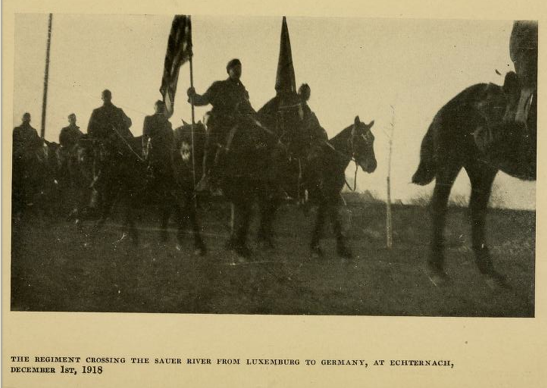 They spent the winter of 1919 near the Rhine River. On April 22nd, they finally began returning home.3 Pvt. Eberhard received his honorary discharge in June. Roy settled back into civilian life, married, and had two sons. 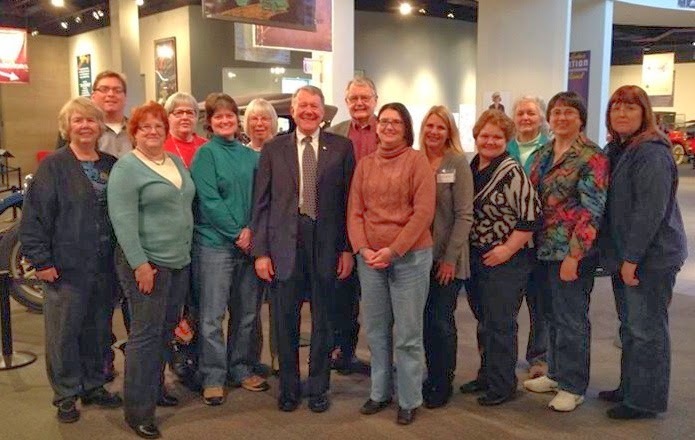 He began a career with the railroads. With his military service and youth behind him, Roy David Eberhard probably thought the U.S. Army was done with him. Even when the news from Europe turned grim again, and young men geared up to say goodbye to their loved ones like he had two decades earlier, he could rest on the assurance that he had already done his part. 1. “U.S. 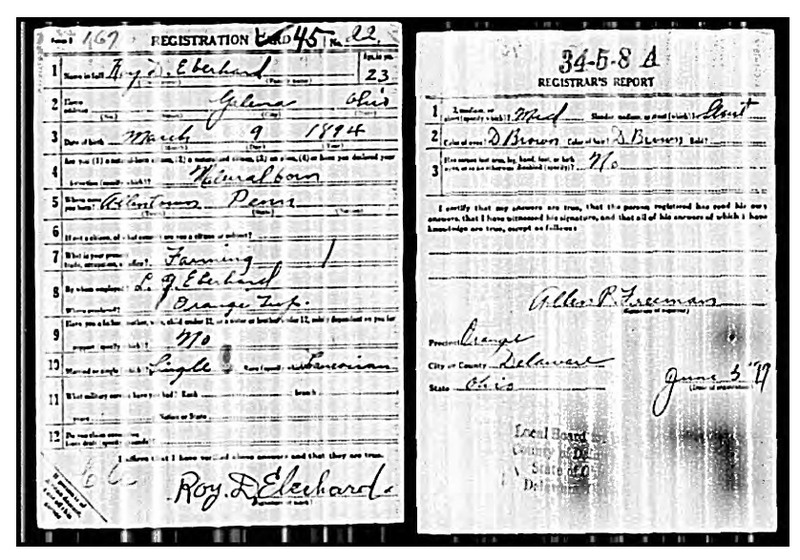 World War I Draft Registration Cards, 1917-1918,” digital image, Ancestry (www.ancestry.com: accessed 25 Jan 2014), Roy D. Eberhard (Delaware County, Ohio); U.S. Selective Service System, World War I Selective Service System Draft Registration Cards, 1917-1818, NARA microfilm publication M1509, roll 1832192. 2. Ohio Adjutant General’s Department, Official Roster of Ohio Soldiers, Sailors, and Marines in the World War, 1917-18 (F.J. Heer Printing Co., 1926), p. 4628, Roy D. Eberhard; database and digital images, “Ohio Soldiers in WWI, 1917-1918,” Ancestry (www.ancestry.com: accessed 25 Jan 2014). 3. T. Q. Ashburn, History of the 324th Field Artillery, United States Army (New York: George H. Doran Co., 1919), p. 24-25; digital copy, Internet Archive (https://archive.org/details/historyof324thfi00ashb : accessed 25 Jan 2014). Images used here appear on page 10 and page 80. 4. “U.S. 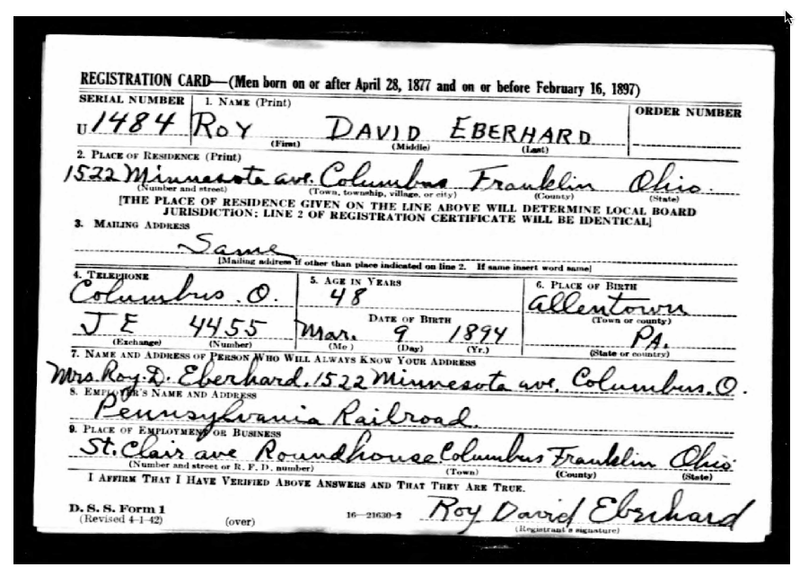 World War II Draft Registration Cards, 1942,” digital image, Ancestry (www.ancestry.com: accessed 2 Nov 2013), Roy David Eberhard (Franklin County, Ohio); U.S. Selective Service System, Selective Service Registration Cards, World War II: Fourth Registration; FHL microfilm 2,372,762. 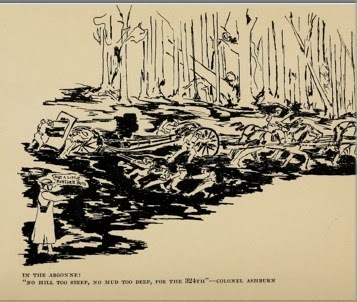 This is the fourth in a series of family history stories written for the blogging prompt “52 Ancestors in 52 Weeks,” coordinated by Amy Johnson Crow, CG, author of No Story Too Small. It isn't easy to interest strangers in your family stories, but your writing style engaged me all the way to the last line. Well written story - thank you for sharing! Thanks, Laura--I'm glad you enjoyed it! I found it fascinating to research. How I agree with Laura. I am drawn immediately into the story by your style of writing which captures what Roy's life was like. 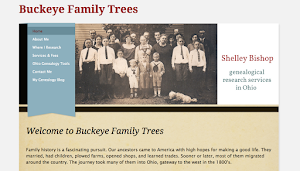 It is a very different approach to the more usual "report" style that many of us adopt.in writing about an ancestor. A very enjoyable post. Thanks so much, Sue. It's always a challenge to write about people we never had the chance to meet, isn't it? I find it helps to find an episode, a moment in time, and get as deeply into it as I can. I really appreciate your kind words!